The eighteenth-century British master Thomas Gainsborough (1727–1788) is celebrated for his portraiture and for his depictions of rural landscapes. Although he was best known as a painter, he was also a draftsman of rare ability. 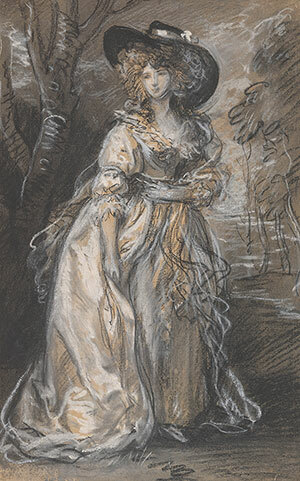 Gainsborough experimented with various media to sketch preparatory studies, finished works, and in some cases exercises for his own enjoyment. Thomas Gainsborough: Experiments in Drawing brings together more than twenty works primarily from the Morgan’s collection that reveal the artist’s technical innovations, his mastery of materials, and his development of a new and original mode of drawing. Thomas Gainsborough: Experiments in Drawing is sponsored by Lowell Libson & Jonny Yarker Ltd. and generously supported by Mr. and Mrs. Clement C. Moore II and the Eugene V. and Clare E. Thaw Charitable Trust. Thomas Gainsborough (1727-1788), Lady Walking in a Garden, ca. 1785, black and white chalk with smudging, worked wet and dry, watercolor, on laid paper, purchased by Pierpont Morgan in 1909. The Morgan Library & Museum, III, 63b. Photography by Steven H. Crossot, 2014.